Now that it's finally summer break I am slowly working to check things off my 'to do' list. There have been quite a few blog items I wanted to try. My first item is starting up a weekly link up. I have wanted to start one for a while and I am so excited to announce that next Tuesday will be the first Confident Twosdays! I think it's so important to be confident in yourself and what you are wearing so link your beauty or fashion related posts that made you feel confident! You will have the option of linking up 1 or 2 posts as well. I hope you all take a moment to visit and link up and I will make sure to visit everyone's link, too. This is such a great color combo. The link up sound like a lot of fun. Cute outfit. I pinned something similar but when I tried it, it didn't look near as cute as this does on you! almost bought that shirt!! now kicking myself. 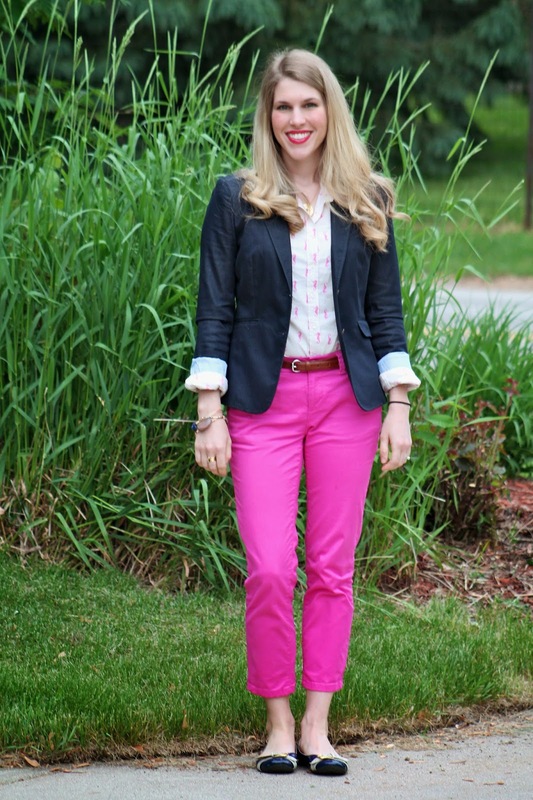 I think pink and navy make such a good pair, and I am loving it even more with this cute blouse! Love the linkup idea! Love your pink pants! The perfect bright for summer work wear! Love that you are going to start a link up--and I love the concept behind it :) I will def. be joining in!! And you look beyond adorable! I love NY&Co clothes and I rarely see them on the blogs! (I will admit: their website is not helping them...) Excited for the new link-up! They used to be one of my favorite stores a couple years ago. I still like their stuff, but I feel like they don't have as good of deals as they used to. I wish they would have their good coupons like $25 off $50 again! Rockin' the pink trousers! I love it! I so love this pairing. Have been wearing it as well. It's classic, chic and yet so soft and feminine. Laura you look gorgeous. 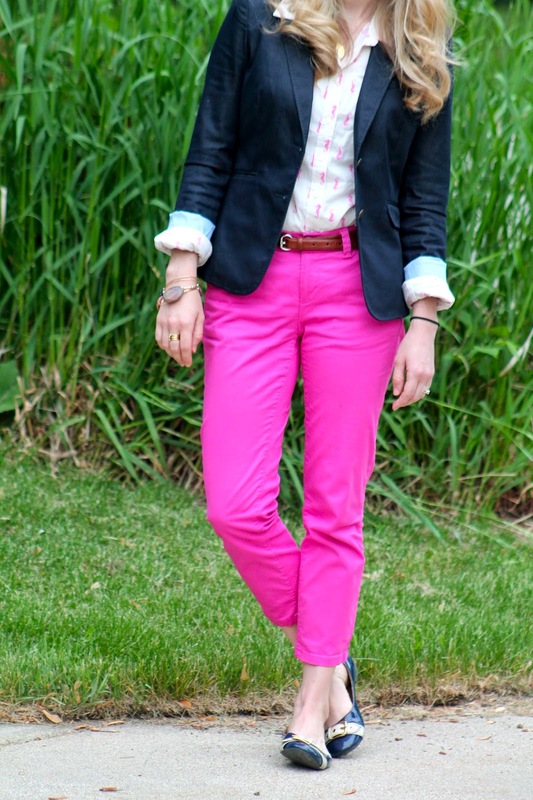 Love this classic preppy look! Excited about your new linkup! Yay for finally being on your summer break! And yay for pink and blue together! And yay for a new linkup! 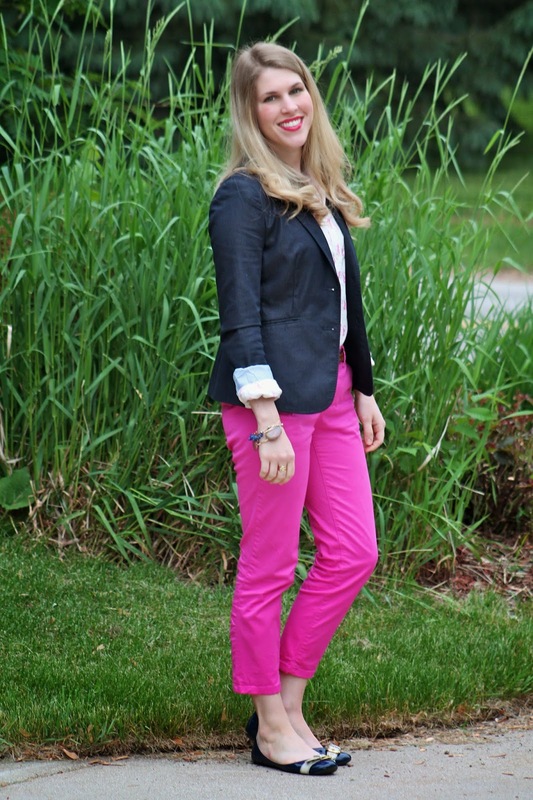 It's always cute to see classic/preppy styles with a twist and this outfit is just that! 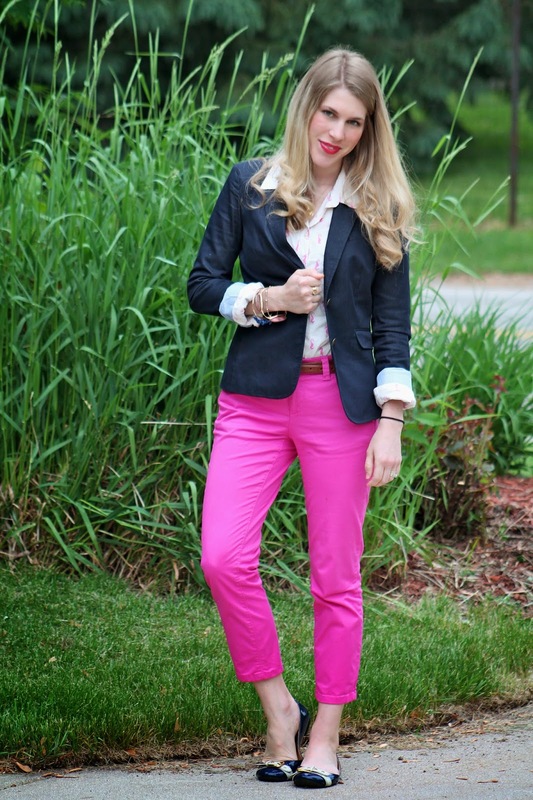 I love how you combined the classic navy blazer with pink and the fun printed shirt. Have a fab Tuesday! I can't get enough of colour so of course I love your trousers! Great how you've teamed them with a navy blazer and matching shoes! Those pants look so fantastic on you, and they are too cute with your seahorse shirt! Looking forward to the link-up! Navy blue goes so well with purple! I am having my purple pants on today and will add a denim jacket when I walk my dog later. Love this color combination Laura - it's one of my favs!! Love this combo, and this whole look - might be my favorite of yours this week.